Mobile usage will exceed that of all other devices combined by 2018 according to Global Web Index. A quality mobile experience is a must have for any brand today. 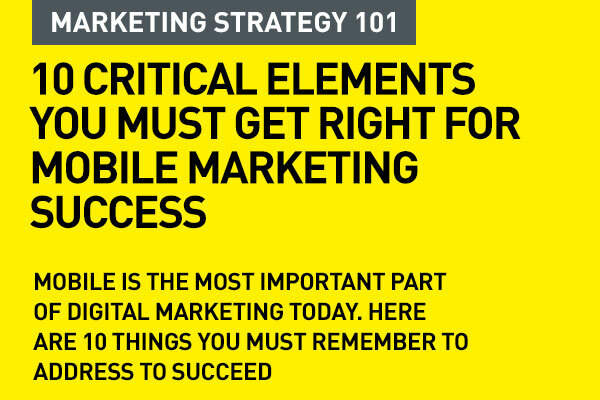 Here are 10 important points to remember when developing a mobile strategy. 1. Focus on the audience. You need to really understand what your audience wants as an experience on mobile. Remember, that they'll want that something almost there and then – that's the very nature of mobile. Today's process is not as simple as Awareness to Intent to Desire to Action. There's a lot of research and social interaction involved in between. Remember to plan the experience based on the mobile screen itself. Plan for thumb action. Make interactions easy. 4. Be there on mobile. Whether on a responsive website or an app, or both, you need to be there when your audience is looking for a solution. Mobile should not be a lat point to tick off on your marketing strategy list. Today you need to have a mobile specific strategy for your brand that focuses on the consumer – your target audience. Develop an engagement strategy and decide what serves your purpose better – a responsive website or an app – or both. Regardless, you have to have clear insights on what your audience needs are and provide appropriate information and content. 30% of visitors immediately switch to another site if they don’t get what they need. This experience needs to bale to provide for quick interaction and be easy to navigate through. Reduce steps and layers for the user. Make information easy to access. Make calls to action easy to see and respond to. Remember to plan for the thumb as interaction tool. Don't stop at making your website mobile friendly. Your emails should be responsive and mobile friendly as well. Your social media content should be geared for mobile engagement. Your video content should be mobile ready. Some brands are actually creating vertical videos these days, keeping mobile in mind. Remember that today's audiences move from one screen to another for convenience and ease of use. They pick whatever device suits them at whatever time of day. This is both a challenge and an opportunity. 10. Don't ignore Wearables. They are the most immediate form of Mobile. Wearables provide a huge opportunity for here and now engagement. Wearables aren’t a fad or trend that can be ignored. Like mobile, the technology is here to stay—and to transform digital marketing as we know it. Wearables help gather insightful customer data—including location, behavior and activity levels—which can be used to deliver personalized marketing messages. And, remember that wearable is wheneverable and whereverable! 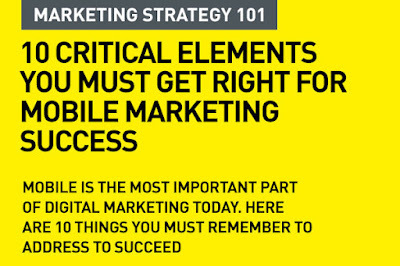 Useful list to keep when planning for mobile marketing. Thanks.